Reach speeds of up to 200km/h after plunging from a height of 233m! 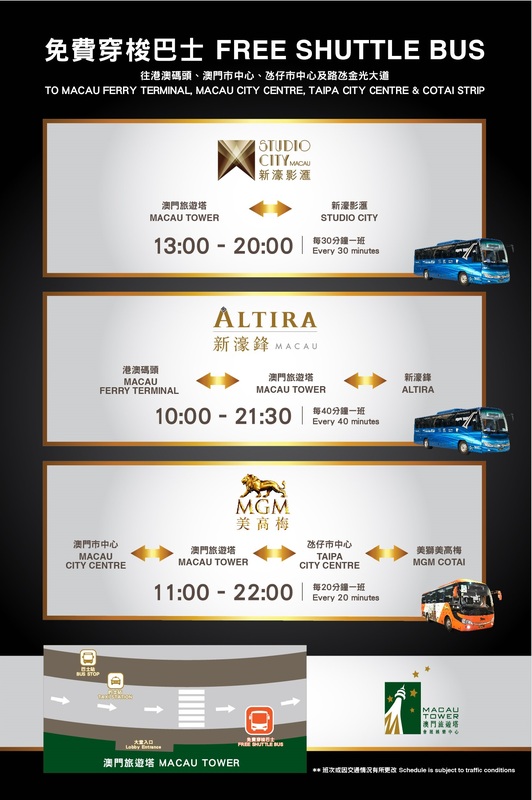 Do you want to try other exciting activities in Macau? Skyjump, Skywalk, and Tower Climb are waiting for you! Nothing to worry about, it's safe! All staff are friendly and professional. No long queue, hassel-free. suggest to check weather forecast beforehand, you don't want your photos turn out to be like mine. 😂 overall, a good experience. For the ultimate extreme journey, free-fall at a speed of up to 200km/h from the World's Highest Bungy Jump! 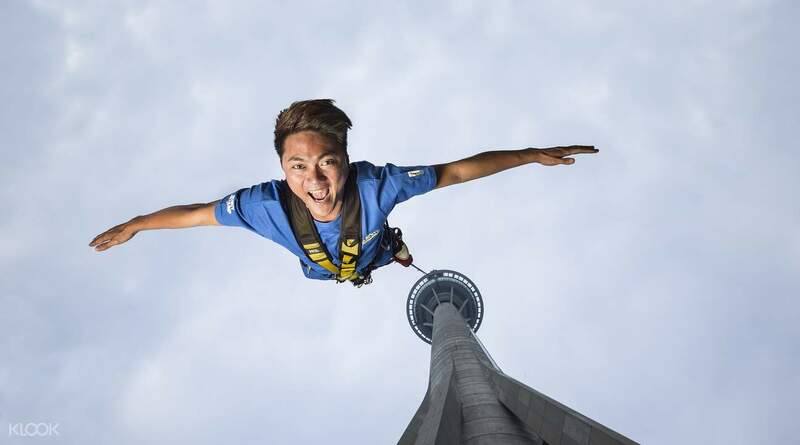 Plunging from a platform 233 meters high, challengers will experience a 4-5 second free-fall before stretching the 50 meter bungy cord and rebounding at 30 meters above the ground. 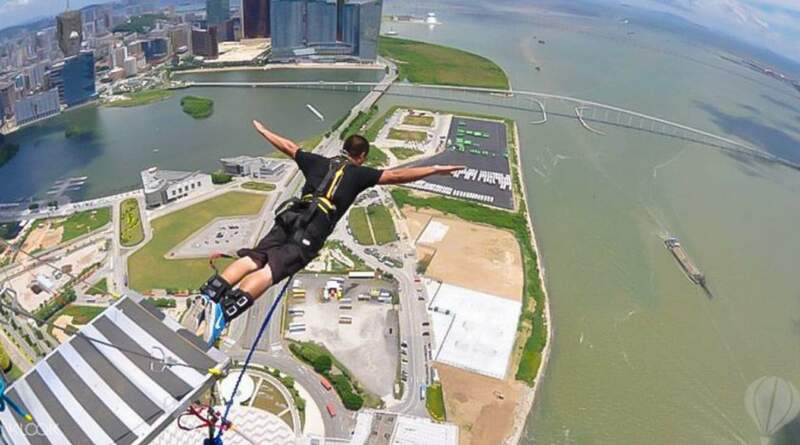 So go on, take a leap from the Macau Tower – be part of the Guinness World Record and show everyone you have what it takes! 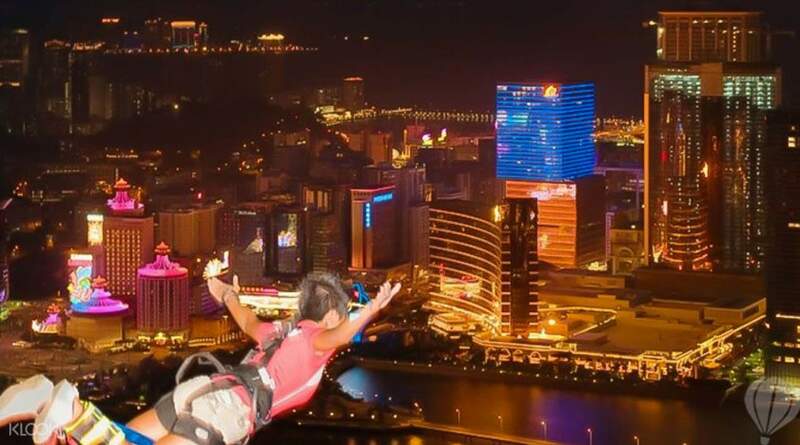 Take the leap from 233m high! Bungy by day or night! The best of the best! More terrible can not be. The staff team is very professional and responsive. I recommend everyone to try to jump at least once. Unforgettable emotions. The best of the best! More terrible can not be. The staff team is very professional and responsive. I recommend everyone to try to jump at least once. Unforgettable emotions. Definitely worth it. A must try when in Macau. Too many Filipinos working in the tower as well and they are very friendly. There are also a lot if Filipinos working as a crew in AJ Hackett and they will help you be ready for the jump. Definitely worth it. A must try when in Macau. Too many Filipinos working in the tower as well and they are very friendly. There are also a lot if Filipinos working as a crew in AJ Hackett and they will help you be ready for the jump. Great experience and you should try once! You are free on your 4th bungee jump. Wow!!! Great experience and you should try once! You are free on your 4th bungee jump. Wow!!! It was amazing. The deal at klook it’s much cheaper and the staff there were really friendly. Would definitely do it again in the futurue. It was amazing. The deal at klook it’s much cheaper and the staff there were really friendly. Would definitely do it again in the futurue. It’s really a great experience, amazing! Life only once! All the staff very nice and they will make some joke to let you relax! They will check all the equipments carefully and detail, so it’s very safe. It’s really a great experience, amazing! Life only once! All the staff very nice and they will make some joke to let you relax! They will check all the equipments carefully and detail, so it’s very safe. From a few days ago (while still in Thailand) I started getting some butterflies for this morning’s event. I jumped off of the world’s highest bungee jump at 233m, Waiting wasn’t as bad as I thought, it takes about 8 minutes per person and about 5 people are outside in a line, slowly moving towards the front. When you get to being double on deck you start to feel the wind moving the platform a bit and when someone jumps you feel it, ever so slightly, but nonetheless you feel it. Then you sit in a seat to have the leg harness put on, that is when the nerves really hit you. The jumper before you is finished and his harness and GoPro are being reeled 233m back up, the jumping with with the recoil takes about 4 minutes, so about 2 minutes for the rope to come back up. 1 out of 10 jumpers back out somewhere between that point and getting up to the platform. Standing on the edge.. Alighting from the seat I made my way slowly in little baby steps (feet are bound together) to the ledge. Two supervisors are holding my ropes and telling me to smile 🤒. They give a 3,2,1 count and I lent forward, absolutely petrified those first couple seconds and then pure exhilaration! Reaching speeds up to 200kph was amazing! I felt incredible hurling down towards the ground, the adrenaline rush, no words.. It was my second time bungee jumping, the first was in Queenstown about 15 years ago. This blew that experience out of the water... If you have an inkling to do this, do it. It’ll brighten up the dreariest Macau day! From a few days ago (while still in Thailand) I started getting some butterflies for this morning’s event. I jumped off of the world’s highest bungee jump at 233m, Waiting wasn’t as bad as I thought, it takes about 8 minutes per person and about 5 people are outside in a line, slowly moving towards the front. When you get to being double on deck you start to feel the wind moving the platform a bit and when someone jumps you feel it, ever so slightly, but nonetheless you feel it. Then you sit in a seat to have the leg harness put on, that is when the nerves really hit you. The jumper before you is finished and his harness and GoPro are being reeled 233m back up, the jumping with with the recoil takes about 4 minutes, so about 2 minutes for the rope to come back up. 1 out of 10 jumpers back out somewhere between that point and getting up to the platform. Standing on the edge.. Alighting from the seat I made my way slowly in little baby steps (feet are bound together) to the ledge. Two supervisors are holding my ropes and telling me to smile 🤒. They give a 3,2,1 count and I lent forward, absolutely petrified those first couple seconds and then pure exhilaration! Reaching speeds up to 200kph was amazing! I felt incredible hurling down towards the ground, the adrenaline rush, no words.. It was my second time bungee jumping, the first was in Queenstown about 15 years ago. This blew that experience out of the water... If you have an inkling to do this, do it. It’ll brighten up the dreariest Macau day! Couldn’t jump on the initial date we booked due to typhoon but gratefully, we are able to jump on the following day and it is absolutely an unspoken experience, feel it to know it! Why live on the edge when you can jump? Couldn’t jump on the initial date we booked due to typhoon but gratefully, we are able to jump on the following day and it is absolutely an unspoken experience, feel it to know it! Why live on the edge when you can jump?